Exploring military history, strategy, and ideas through the lens of great books and an awesome podcast! In the following interview, Dr. Bechtol discusses the threat of North Korea. North Korea has made headlines for their ICBM tests and nuclear tests. We discuss the threat that they pose as well as get into the details of their regime, their current leader, past provocations, weapons systems, and options that the U.S. and its allies have to deal with them. We begin the interview discussing the current situation between the U.S. and North Korea. North Korea recently threatened to fire ICBMs at Guam. But, Kim Jong-un backed down… for now. Dr. Bechtol talks about the different types of missiles that the North Koreans have to include Musadan, KN-08, and KN-14 missiles. The Washington Post reported North Korea’s advancement of miniaturized nuclear warheads. But, Dr. Bechtol says that this is nothing defense officials haven’t been aware of for several years. However, what has changed is that they have successfully tested the range of their ICBMs, and have displayed that they are capable of hitting the U.S. or Guam. Dr. Bechtol discusses the current defense capabilities that the U.S. has to bring down a North Korean ICBM. What type of state is North Korea? North Korea (aka Democratic People’s Republic of Korea or DPRK) a dynastic system, run by elites with a love for Joseph Stalin. Who is Kim Jong-un? He was educated in Switzerland and grew up loving NBA basketball. Some thought he might be a moderate leader when he came to power. But, as a leader, he has ruled North Korea with an iron fist and carried out many purges. Dr. Bechtol talks about the political institutions in North Korea- the Party, the Military, and the Security Services. In the political system of the DPRK, everyone is watching everyone else. It’s a bizarre system of “checks and balances” in which “big brother” is always watching. Dr. Bechtol talks about how Kim Jong-un may not have the support of the North Korean military. Thus, he has used military tests, provocations, and brinkmanship to solidify his support. What type of cyber technology does North Korea have? They have sacked Sony, hacked NGO’s, and sought to raid South Korean financial institutions. Dr. Bechtol breaks down the tactics of North Korea’s violent provocations. They conduct “short” attacks to inflict massive casualties to strike fear in the hearts and minds of South Koreans. But, South Korea has stepped up their defenses to deter and respond to the North’s provocations. We discuss the current command and control structure between the U.S. and our allies, South Korea (aka Republic of Korea or ROK). The Combined Forces Command establishes unity of command between U.S. and ROK forces. The CFC commander, a four-star general, takes his strategic and operational guidance from the U.S. national command authority and the ROK Minister of National Defense. Dr. Bechtol assesses how and why the U.S. and China is working to plan for “contingencies.” What would happen if the North Korean regime collapsed? The U.S. and China would need to work together. Dr. Bechtol says that the North Korea will implode stating it’s a matter of “if not when.” At that point, the U.S. will need to work directly with China. On August 16, General Dunford, the Chairman of the U.S. Joint Chiefs of Staff, met with Chinese military leaders in China. Dr. Bechtol reiterates the need for the U.S. to develop its ballistic missile defense (BMD) technology. 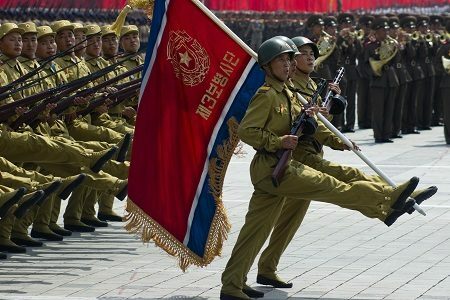 How could the North Korean regime collapse? Dr. Bechtol explains, “Planning is a nightmare.” There are hundreds of possible scenarios for a collapse. If North Korea collapses, Dr. Bechtol mentions that forces have been training to recover nuclear and chemical weapons. He says that they could fetch a high price on black markets. Use economic pressure. For example, the Patriot Act Section 311 goes after banks that do business with rogue regimes. Dr. Bechtol says we need to use this. Bottom Line: Sanctions need to be enforced. The U.S. needs to stand up an inter-agency task force to make it happen. Be sure to keep an eye out for Dr. Bechtol’s next book, Enabling Instability and Violence, which will be published in 2018. Sign-up for the PME Complete newsletter to get tips, tricks and book reviews.